This is another shot from the “Hopilicious Hiking Trip” I took last week with Rogue Wilderness Adventures. 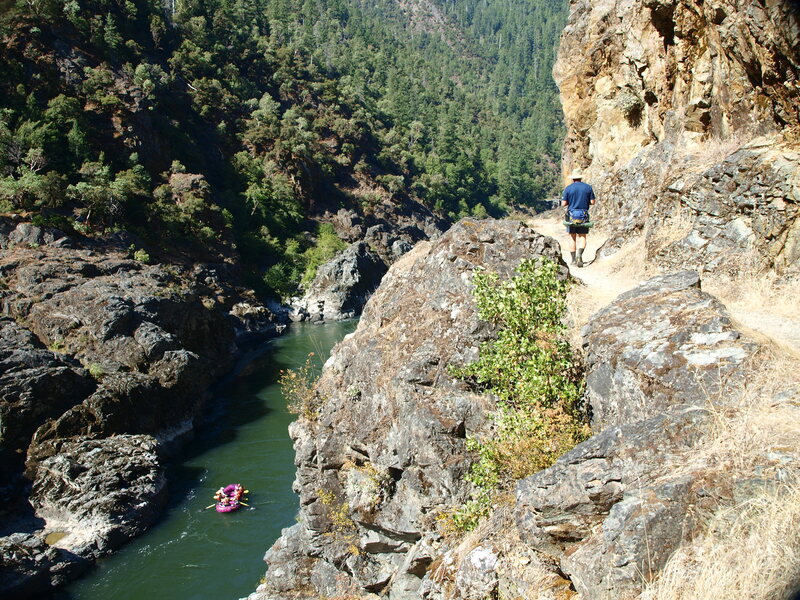 We would hike along the Rogue River Trail during day, then sample beer in the evening. On this trip we had the brewmaster from Ninkasi, Mark, along for the entire excursion. In this photo you see one of my fellow hikers on the trail, and one of the rafts from the “Paddles and Pints” trip on the river just below. Paddles and Pints is the whitewater rafting version of the hiking trip, also run by Rogue Wilderness Adventures. Click on image for larger view. 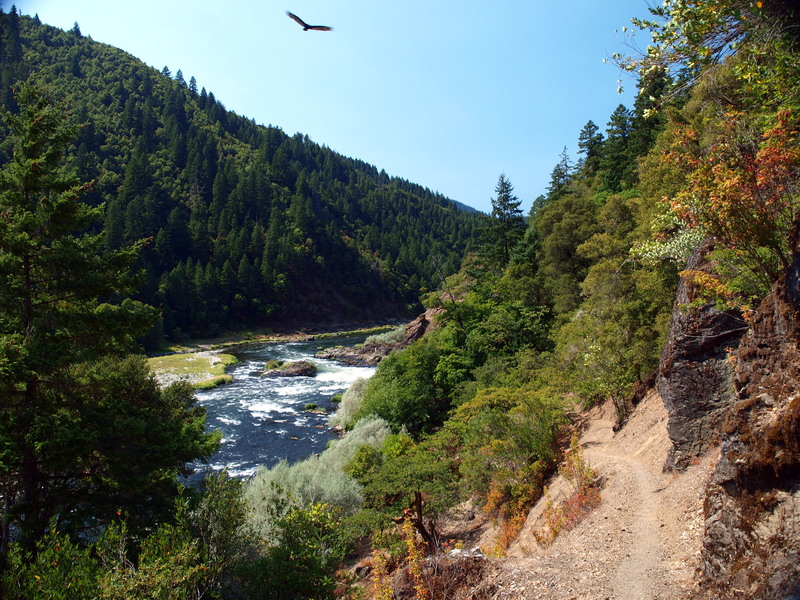 The Picture of the Week is delayed a bit again this week due to a return trip to the Rogue River. I was a guest again of Rogue Wilderness Adventures, only this time for their Hopilicious Hiking trip. Hiking, beer tasting, rafting, and views like this for 4 glorious days and 3 nights. I would like to again thank all of the folks at Rogue Wilderness Adventures for throwing more awesome my way than one person can really be expected to handle. You are top shelf folks, top shelf! Click on the picture for a larger view. A few weeks ago I was lucky enough to be the only writer covering the Collage Beer Dinner at the Wildwood restaurant here in Portland. It was kind of a last minute invitation, so I didn’t know much about the event or what to expect going into it. Once I arrived, however, it didn’t take long for me to realize that the magnitude of my luck was perhaps Richter scale-worthy. The Collage Beer Dinner as it turns out, was a masterful collaboration of food and beer. 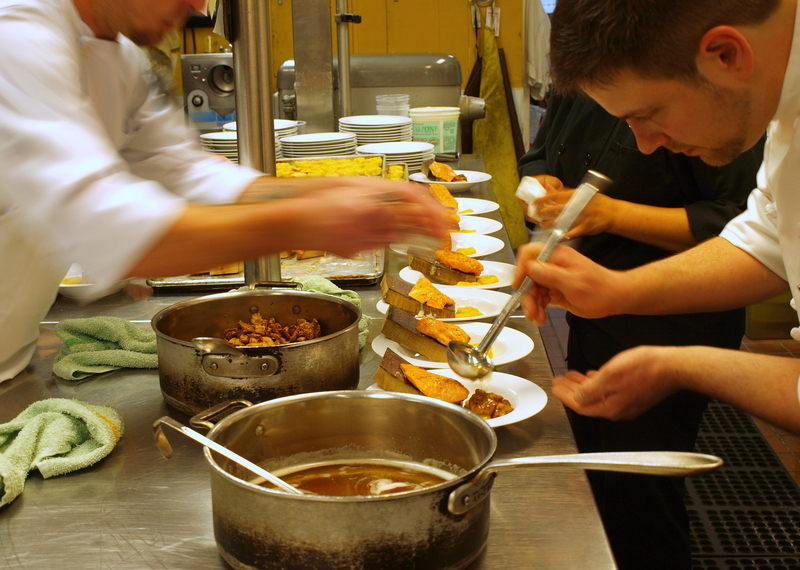 The culinary teaming of Wildwood Chef, Paul Kasten, and Deschutes Executive Chef, Jeff Usinowicz, produced five food courses. 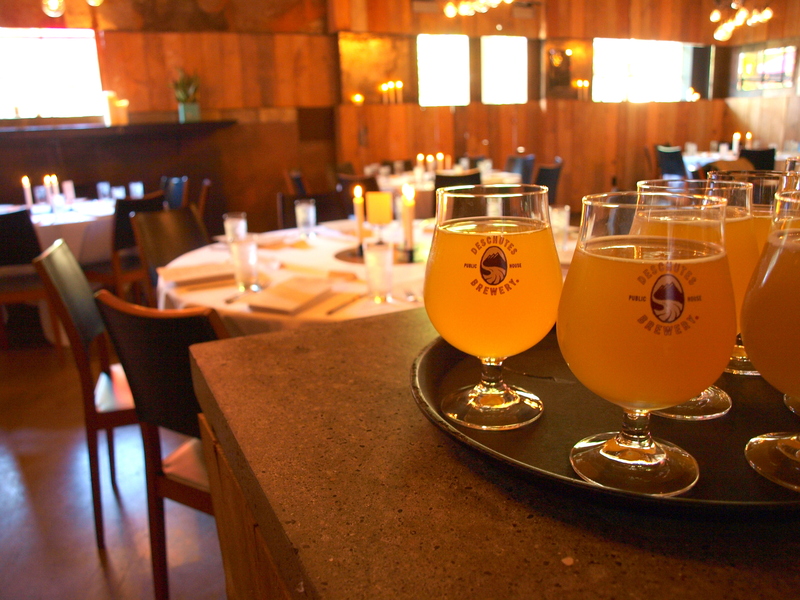 While the Deschutes Brewery and the Hair of the Dog Brewing Company offered up beer pairings for each course that were produced specifically for two Collage Beer Dinners. One in Bend and the one I attended in Portland. A portion of the proceeds from each dinner would be going to charitable organizations in each city. 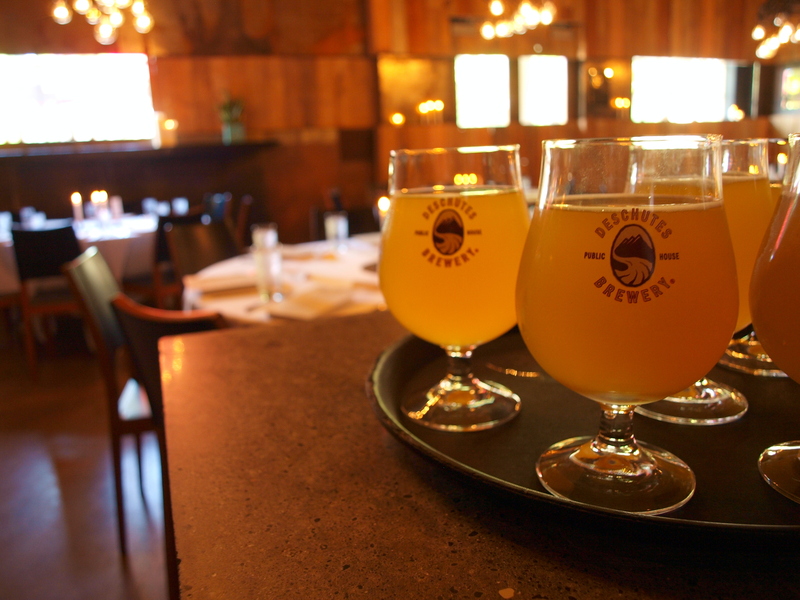 So I’m supposed to sample beer, some of which would not be made available anywhere else, paired with food collaboratively born in one of the premier kitchens in Portland? You got it. The attendees where an eclectic bunch: beer snobs, foodies, a beer and food loving travel writer, and employees from both Deschutes and Hair of the Dog. There were also a number of beer dignitaries in attendance, including Hair of the Dog owner, Alan Sprints. I wound up seated at one of the “big kid” tables next to the likes of Deschutes Brewery owner, Gary Fish, his lovely wife Carol, and Deschutes Brewmaster, Cam O’Connor. Better keep the swearing to a minimum. The dinner started with Mizuna Gardens baby greens. Presented with spring onions, Dissident dried cherries, truffle tremor, late harvest sauvignon blanc vinaigrette, and duck confit. The salad was paired with The Dissident from Deschutes; 100% aged in a French pinot barrel from Domaine Drouhin. Yep, that just happened. The salad and beer where respectively magnificent, but their pairing set the tone for the evening. The next course was an oak plank wild salmon. The dish included green garlic gnocchi, hedgehog mushrooms, and brown butter, paired with The Stoic from Deschutes. What a pairing this was. The salmon and hedgehog mushrooms where brought to life by The Stoic; 100% aged in a rye whiskey barrel from Heaven Hill. The salmon was perfectly cooked and the flavor of the mushrooms seemed to ruminate with the assistance of the Belgian-style Quad. Next, we moved into Hair of the Dog territory. 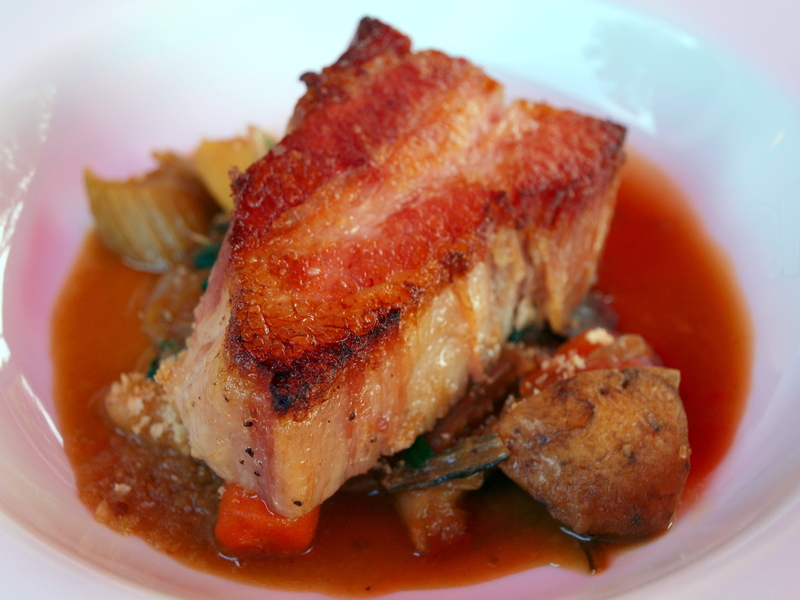 Course three was a seared pork belly confit served with a bourbon ribollita, and rainbow chard. Paired with Hair of the Dog’s Fred, 100% aged in a Midwest bourbon barrel from Francois Freres. I don’t mind telling you that I’m generally not the biggest pork belly fan, but I chewed the daylights out of this dish. The texture and the flavor of the meat where very much on point and the ribollita was expertly touched off by the bourbon flavor finish of the Fred. 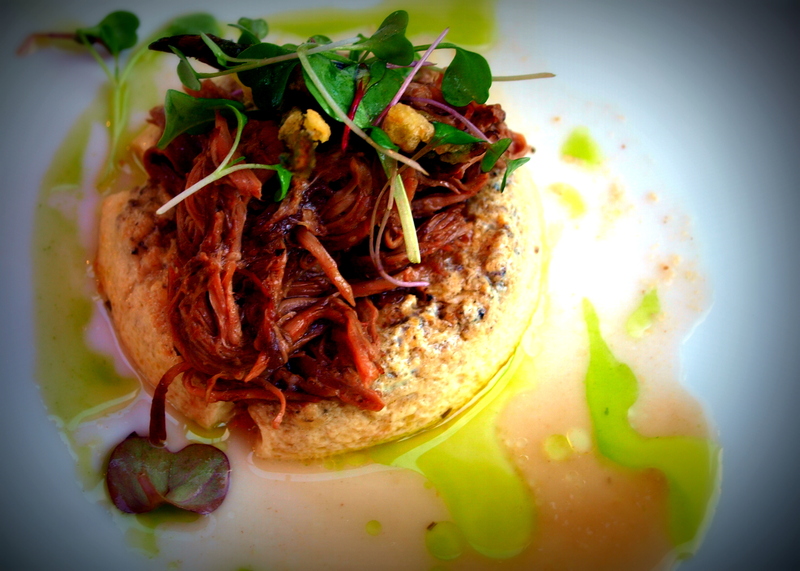 We were then served cocoa braised oxtail atop a morel mushroom flan with crispy asparagus. 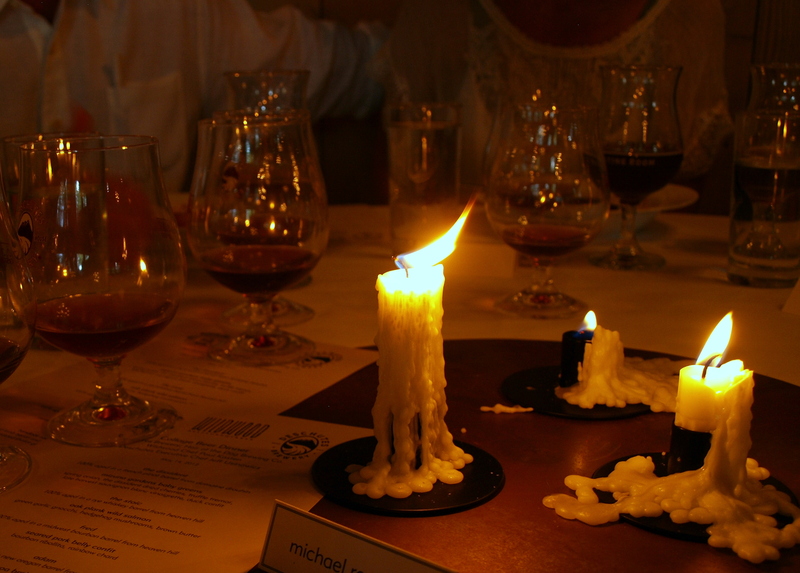 The dish was paired with Hair of the Dog’s Adam; 100% aged in a new Oregon barrel from Francois Freres. This dish was a superbly choreographed dance between taste and texture. It didn’t hurt things that Adam is one of my favorite beers, and it has very little to do with the name. Arguably saving the best for last in all aspects, the final course of the evening was a tandoor roasted lamb chop. Accompanied by brewery cured lamb bacon and new potato hash, sautéed pea vines, roasted shallot glace, and black truffle oil. It was paired with the event’s namesake beer, Collage. A thoughtful and careful combination of The Dissident, The Stoic, Fred, and Adam, the Collage was complex and damn near transcendent. I know it’s just beer, but if you really love and appreciate beer, then you understand. Paired with what might have been the best food offering of the evening, the word transcendent seems all the more befitting. Dessert was a pistachio cake dreamed up by Pastry Chef, Jill Ramseier. It was comprised of white chocolate-whiskey mouse, sweet cherry meringue, and tart rhubarb coulis. That scrumtious piece of awesome was a hell of a way to finish off the evening, or so I thought. As luck would have it, Gary Fish has known Alan Sprints for a long time. In fact, he still owned a case of Fred #1 that he purchased when the beer made its debut some 14 years ago. Gary had been saving that beer for a special occasion, and this night was it. When Gary produced the case of Fred #1 and began pouring it for the group of adoring beer fans, emotions erupted. Some people cheered out loud, others sat in stunned silence, and still others where literally moved to tears. Again, I know it’s just beer, but….. It was a special event, and a very special evening. In true Collage spirit, everything we ate, drank, and experienced, was greater than the sum of its parts.